A sizeable crowd filled the iconic Tuffnell Park Dome venue ready for an electric evening, kicking things off was high energy outfit Tokyo Taboo; frontwoman Dolly Daggerz strutting out onstage in what seemed like foot high heels. Tokyo Taboo’s performance was a mixture of a concert and a burlesque show, guitar driven punk rock with a stripped pole, Dolly’s energy never took a hit with songs like ‘Papercut’ and ‘Whisky’. Taking the show into the crowd multiple times throughout the set to party and take selfies with the audience, until the penultimate song ‘Drowning’ where the band instructed everyone to take a seat while Dolly serenaded members of the audience. As the lights went out and Eminem’s ‘Lose Yourself’ boomed out of the speakers, Josh Katz and Co. took to the stage to hundreds of screams from the audience, with a quick wave to the crowd; Badflower launched into X ANA X from their debut album! Songs like ‘Drop Dead’ and ‘Die’ had the crowd move into a furious moshpit of dancing bodies before taking a quick breather for the slower ‘The Jester’, Katz channelling his inner Kurt Cobain while flinging himself all over the stage whilst letting out the occasional angsty lyric. When hearing some of their most popular songs played live, i.e. ‘Heroin’ and ‘Ghost’ it is hard to believe they are on the subject of self harm, as every single member of the audience joins in chanting the lyrics back to the band whilst dancing to their hearts content. This is part of the bands message to get people to start talking more about depression, self-harm and addiction, it is slowly becoming more and more widely talked about but there is still a stigma especially with young men. Finishing their set with a four song encore, including some earlier songs ‘Move Me’ and ‘Mother Mary’; melancholy anthem ‘Promise Me’ reminds us of an early My Chemical Romance song, once again Katz gothic-pop tones were heard blasting out of the speakers! 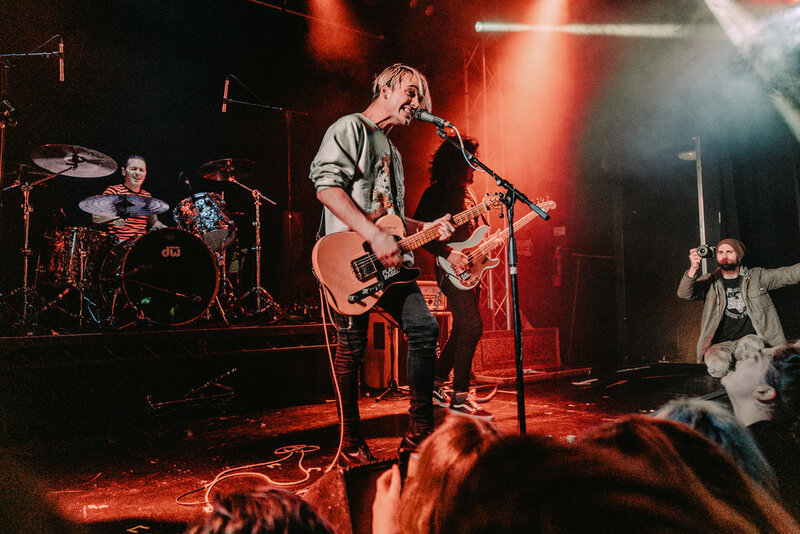 Badflower are one album down and so far it has been nothing but pure musical magic, we are all looking forward to hearing what they have to bring for album 2, but for now we are totally fine with reminiscing of tonight’s show and listening to ‘OK, I’M SICK’!! !